When it comes to virtual reality on the PC, the most important component is probably the graphics card. Without the graphics cards, these VR headsets would number 1: not have enough fps and number 2: not have decent enough quality to prevent motion sickness. To have an overall good experience with Virtual reality these two points are very important. Most VR Headsets try to reach 90 fps in each eye. This of course means that computers need to be quite powerful in order to reach this fps target in not just one screen but two screens showing slightly different images. In this list we will go through some of the Best Graphics Cards For Virtual Reality so you can be sure you’re getting a good experience for your VR headset before you buy your graphics card. This list will feature graphics cards of varying prices going from the slightly cheaper graphics cards to the more expensive graphics cards. One of the best mid – high range graphics cards is the GTX 1060. This card has been around for a while and so the price is currently very good. 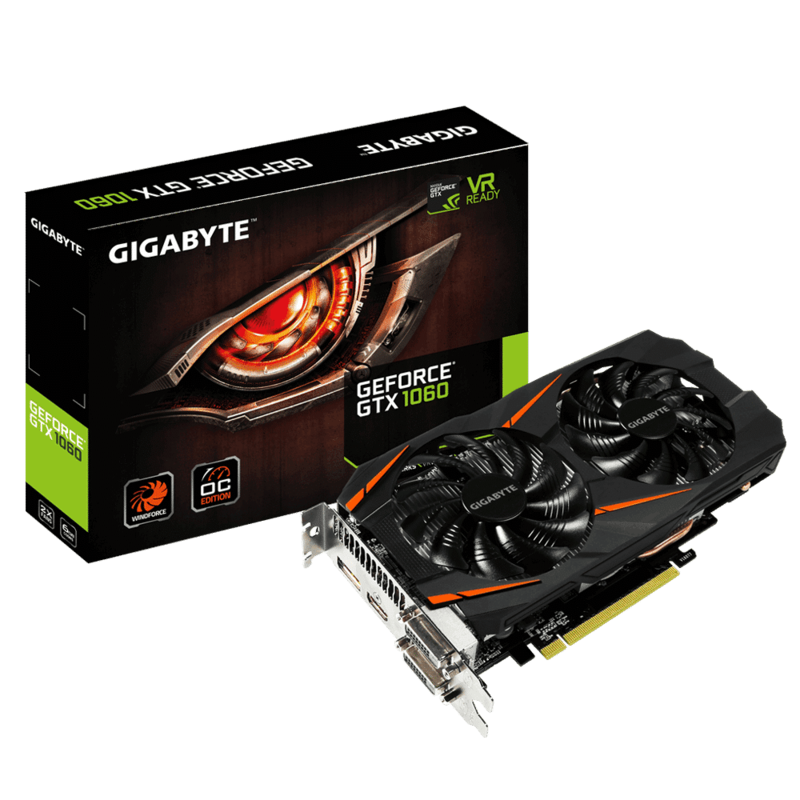 The Gigabyte GeForce GTX 1060 WF2 6GB is VR Ready and has some very good performance. The 6GB version has been chosen as the VR will definitely require quite a bit of memory. Furthermore, you will see a better performance increase and less lag or stuttering with the 6GB version. We dont recommend getting any 3gb 1060 for VR. Gigabyte’s Aorus Graphics Engine allows you to control overclocking, voltage, fan performance and much more from an interface. The performance of Gigabyte’s Geforce GTX 1060 WF2 6GB is very good. Most if not all VR Games can be played at medium high settings with fps staying in the 90 regions and only occasional dips. The Gigabyte GeForce GTX 1060 WF2 6GB has two alternate spinning fans for windforce. This keeps the card relatively cool even when playing intense VR Games. These fans only spin when needed so you can enjoy silence when your computer is not under load. Furthermore the cooling fans are supported by composite heat pipes with direct touch to allow for maximum cooling. The Design of the card is very nice and features a sleek back-plate. As like most graphics cards, there is a HDMI and DisplayPort to allow you to connect your VR Headset. The Zotac GeForce GTX 1070 mini has great performance and is currently at a decent price. Coming in at only about £50 or $70 more than the 1060 the performance increase makes this card great for VR. 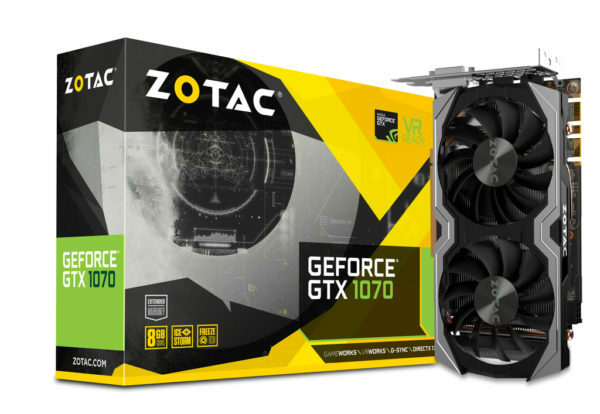 The Zotac GeForce GTX 1070 has great performance better than the 1060 by quite a bit. For this reason it is a great VR ready graphics card. With a large 8GB of GDDR5 memory all VR games can be played at high to ultra settings with hardly any dips in your frame rate. Zotac’s GTX 1070 mini is great for smaller builds as it is not much longer than 8 inches. This makes it perfect for a mini-itx build but doesn’t compromise any performance. Dual fans cool this card in order to provide maximum cooling even when playing in VR. This card has 3 display ports and HDMI so there is not problem connecting VR headsets now and in the future. 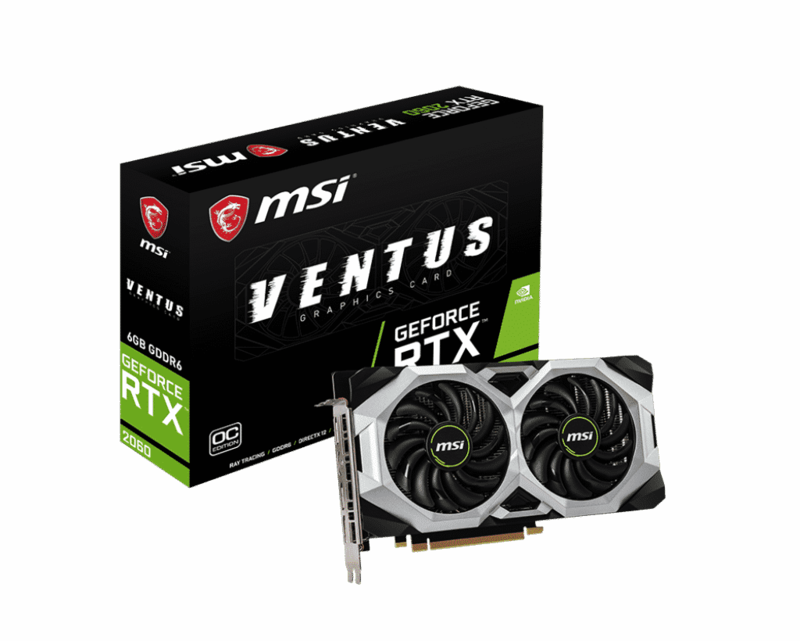 The MSI GeForce RTX 2060 Ventus 6G is a new card from the latest Turing architecture from Nvidia. The Turing architecture allows for real time ray tracing within games for an optimal gaming experience. Since this card is from the latest series, it outperforms most graphics cards from older series including the GTX 1070. However, the price of this card is slightly more than that of the 1070. 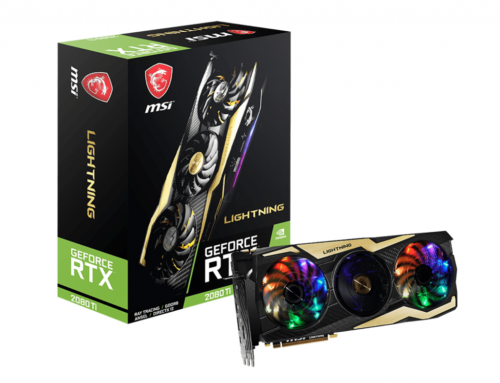 The RTX 2060 provides lots of future proofing however as it is a much newer graphics card. Practically all VR games can be played at high to ultra with a steady smooth 90fps with this card. 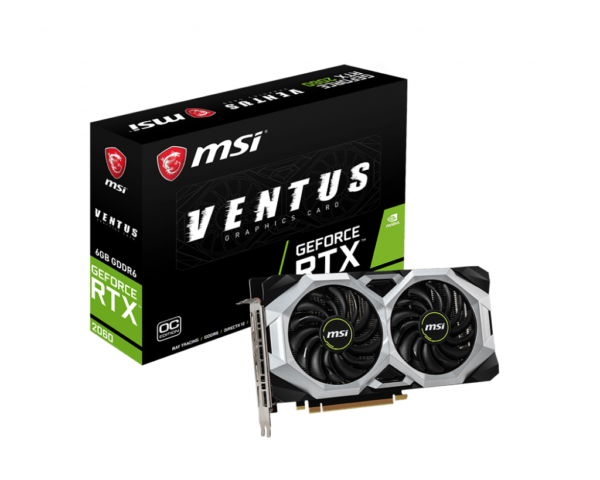 The MSI GeForce RTX 2060 Ventus 6G is factory overclocked for extra performance. This means it has a slight edge over the original and stock RTX 2060s. A high quality and premium design is found on this graphics card. Dual torx 2.0 black fans provide optimal cooling with additional help from the direct contact with the copper heat-pipes. Furthermore, a stylish back-plate is fitted for reinforcements throughout the board and nice aesthetics. With MSI afterburner you can control and customize clock speed, voltage, and additionally fan speed. 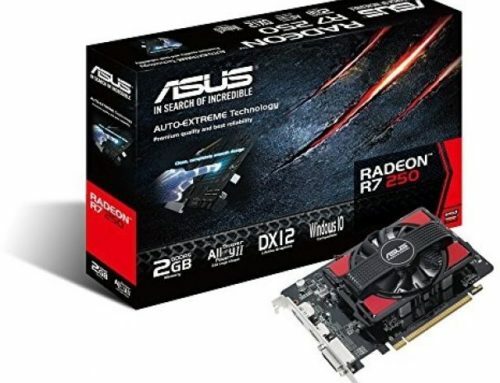 All VR headsets can be used with this graphics card as it has many video outputs including HDMI and Display Port. 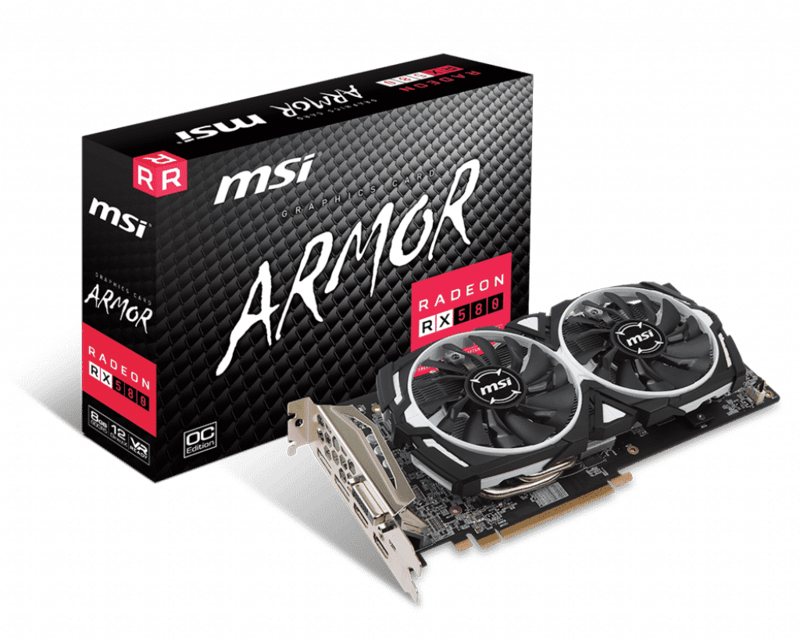 The MSI AMD RX 580 ARMOR 8G OC is powered by AMD’s polaris architecture and is Radeon VR ready. With 8GB of GDDR5 memory, lots of VR experiences can be had with good fps at a very good price. Using AMD’s Polaris architecture, there is good performance when it comes to virtual reality. Most games can be played at high settings with good stability on the fps. However, sometimes the fps dips down below the targeted 90fps especially in intensive games. The MSI Radeon RX 580 ARMOR 8G OC has dual torx fans to provide maximum cooling. Along with the zero frozr, this card can be quiet when not under load but doesn’t compromise on cooling. Featuring a sleek black and white design makes it perfect for a computer aesthetics build or to match your computer. There is no face-plate and back-plate on this card which could be good or bad depending on how you view it. No back-plate allows for better cooling however doesn’t always look as nice or protect from external objects. MSI’s afterburner utility can be used to customize this cards voltage, fan speed as well as monitor your graphics card. 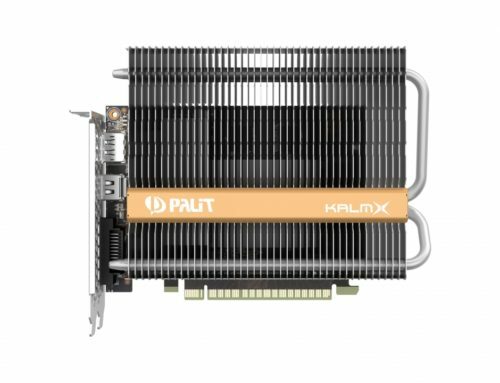 Altogether there are many graphics cards you can get that support VR and provide enough power for smooth VR game-play. Having said this however, these cards can be quite expensive. 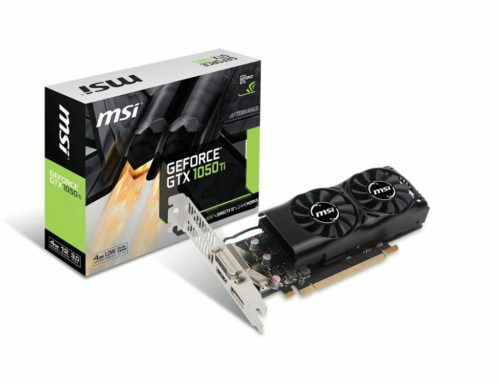 Last gen cards like the 1060 and 1070 are great ways to get into VR on a budget as they are VR ready and have very good performances and reasonable prices. There are some cards that are not VR ready, like the 1050 Ti, that can actually still play VR games at reasonable fps and quality. However, sometimes these cards can dip in fps and cause motion sickness. This shows there are many options to consider at various prices. There are a good variety of graphics cards for most modest budgets. GPUSpecs.com is a participant for the amazon associates program. Commission may be earned on items purchased through links at GPUSpecs.com.